See top Memphis attractions on this narrated sightseeing tour that takes you along the Mississippi River. Pass Victorian homes, historical statues and cultural landmarks like the Pyramid Arena and the Lorraine Hotel, where Martin Luther King Jr was assassinated. Upgrade to include a tour of legendary Sun Studios, where some of the greatest singers recorded their music - including Elvis Presley, Johnnie Cash, BB King and many more. Starting from your downtown Memphis hotel, your friendly, fun, professional guide will take you on narrated sightseeing tour by mini-coach. 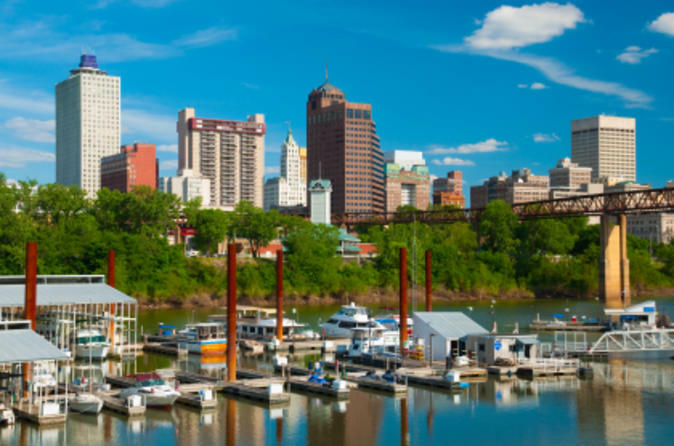 Cruise down Beale Street and Cotton Row, and travel along the Mississippi River and through Victorian Village, where you’ll see homes built in the 1800s. See statues of Elvis Presley and BB King and pass the National Civil Rights Museum, located in the Lorraine Hotel, where Martin Luther King Jr was assassinated. Stop at Schwab, a 120-year-old general store, and pass St Jude Children’s Research Hospital, Sun Studio, and the Pyramid Arena, an astounding 20,142-seat arena resembling an Egyptian pyramid. You’ll also stop at the Peabody Hotel, famous for the 'Peabody Ducks' that live on the hotel’s rooftop and make their way to the lobby in a daily 'March of Ducks' celebration. After your tour, you’ll be taken back to your Memphis hotel.